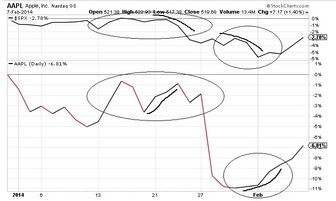 January 18: Apple Shares Volatility Behavior Before Q1 ER (Earnings Release) ? ​potential earnings well in advance. ​already through the sky.​ ​​ But as we know, China will be ​included in that number this year, with some introduction delay which is adding some nervousness on the forecast. ​( See chart below - left scale )​. So in our case is ​February 3rd . Average return from T-4 to T+5 was -39.9%. 7) ​From the event plus 1 trading session, RV correction: ( Taking Closing RV as a Proxy of the past 3 years ) is ​( in our case January 28 2015 ): So from a normalize 100.0 at event Date, it tumble to 76.31 1 day after the event. So RV fell on average of the previous 3 Years 1 day after the event by 23.7%. ​Because we had tremendous volatility in the global markets lately, I decided to study also the Relative Performance ( RP ) of Apple Shares Volatility compare to the Mighty SP500 Volatility . 1) Expectations are the highest of the past 5 years because of the iPhone6+ and Apple Pay. 2) China will be included in the Q1 ER ( which is 15 to 20% of Apple Sales ) with some delay. ​​4) ​Since the Split in June 2014, Apple Shares Behavior are different: Retail Participants will bring more Volatility in Apple Shares Prices. 5) SP500 Futures is in Correction Mode. RV closed on January 16 at ​​2.00, above it s 200 DMA at 1.84. Even if RV seems lower than the past 3 years on average at T-6 ( January 16 equivalent ), pure Volatility​ closed at 41.8% last Friday, level last seen was on April 2013. ​On January 16, Apple Shares tested a Major Support Trendline that started on October 15 then at $105.97 and failed to break it for now... And that can give a different behavior than previous years. 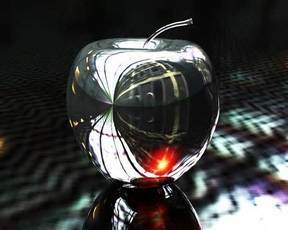 Q1 ER Apple Shares Price and RV Behavior are the most choppiest and volatile of all the quarters Because it is the first quarter that extend new product introduction and volatility from the SP500 at the beginning of the year. ​​​​​​​​​​​​​​​​​​​​​Stay tuned as I will update you in the Daily as usual for specific trading levels. November 16: Apple Shares Behavior Before Thanksgiving ? of Apple Shares. This year it will be on November 27. So in our case will be ​November 21. 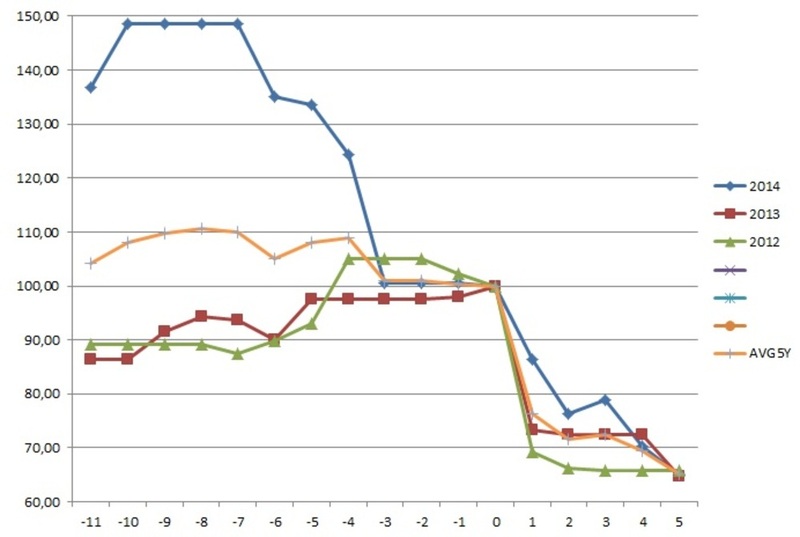 Average return from T-4 to t=0 was +2.7%. Average return from T=0 to T+5 was +2.4%. From the bottom price reached 4 trading sessions prior of the Thanksgiving effect ( So in our case will be ​November 21 ) to 5 trading sessions after ( So in our case will be December 4 2014 ) , on average of the past 5 years, Average return from T-4 to T+5 was +5.2%. 1) Expectations are the highest of the past 5 years because of the pre-order annoucement. 5) SP500 Futures is at the highest ever. Stay tuned as I will update you in the Daily as usual for specific trading levels. October 12: Apple Shares Behavior Before Q4 ER ( Earnings Release ) ? ​included in that number this year, which is adding some nervousness on the forecast. So in our case is ​October 14. Average return from T-4 to t=0 was +2.52%. 4) ​From the event plus 1 trading session, Price correction: ( Taking Closing price as a Proxy of the past 5 years ) is ​( in our case Oct 21 2014 ): So from a normalize 100.0 at event Date, it tumble to 98.6 1 day after the event. So price fell on average of the previous 6 Years 1 day after the event by 1.4%. 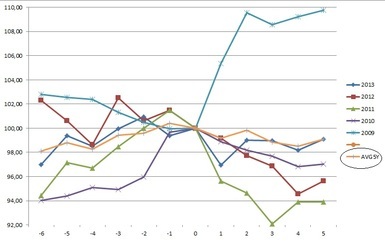 1) RP on average of the past 5 years before the event is grinding 6 Trading Days prior of the event on average. 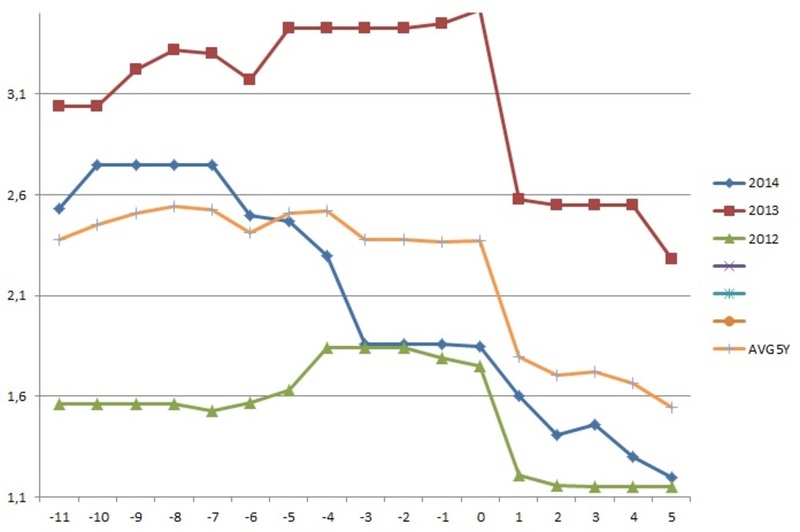 The average outperformance of the past 5 years from T-6 to T=0 was +1.84%. ​​4) From the event plus 1 trading session, Relative Price correction: ( Taking Closing price as a Proxy of the past 5 years ) is ​( in our case Oct 21 2014 ): So from a normalize 100.0 at event Date, delta tumble to 98.6 1 day 1 after the event. So relative price fell on average of Apple Shares over SP500 of the previous 6 Years for the event by 0.8% 1 day Day after the event. 1) Apple Shares is in a grinding process from T-6 to the ER event. 2) Apple Shares outperform the SP500. September 14: Counter Trend is Back ? ​​From September 20 til first week of October. ​and is in the 1st week end selling frenzy of the new iPhones6. ​The counter-cycle between Apple shares and the SP500 is the usual trend. I think we started a Brand New Trading Environment since September 12 for the Market as a whole. The SP500 futures tested and broke the 20 DMA. .​ . That change in sentiment behavior for the SP500 ( to a correction phase from a bullish phase ) and then will bring a lot more volatility that we have seen lately. ​​I Still expect the outperformance of Apple Shares over the SP500 but the ride will be a lot more volatile that we did encounter til now for the market as a whole. I will give specific trading levels in my Daily. ​the Mighty SP500 ( +2.84% ) in % since August 1 2014. 3) ​​​Apple Shares traded with a new high on August 27 ( $102.57 ). I think we started a Brand New Trading Environment since August 27 for the Market as a whole. The SP500 futures tested the uptrend channel support level and broke it on August 27. .​ . That change in sentiment behavior for the SP500 ( to a tiny correction phase from a bullish phase ) and then will bring a lot more volatility that we have seen lately. The fact that on Apple Shares closed with a new high will put ever more confidence for the Bulls. I Still expect the outperformance of Apple Shares over the SP500 but the ride will be a lot more volatile that we did encounter til now for the market as a whole. I will give specific trading levels in my Daily. ​the Mighty SP500 ( +2.03% ) in % since July 1 2014. ​​​August 3 A Brand New Trading Environment ? 2) Seasonalities turned Bearish: E-Mini SP500 Futures: Bearish Seasonalities ? 3) ​​​Apple Shares closed back above the 20 DMA on August 1 ( $95.94 ). I think we started a Brand New Trading Environment since July 31 for the Market as a whole. The SP500 futures tested the 50 DMA ( Day Moving Average ) level and broke it on July 31. .​ . That change in sentiment behavior for the SP500 ( from a tiny correction phase to a correction ) and then will bring a lot more volatility that we have seen this year. On top of that, the SP500 Futures is testing a Major Support Trendline that started on February 2014 ( now at 1923.5 ). IF broken Monday, then expect a more severe correction. The fact that on Apple Shares closed back above the 20 DMA will put ever more confidence for the Bulls. I Still expect the outperformance of Apple Shares over the SP500 but the ride will be a lot more volatile that we did encounter til now for the market as a whole. I will give specific trading levels in my Daily Monday. ​the Mighty SP500 ( +0.08% ) in % since June 1 2014. ​​July 27 A New Counter Trend Phase ? We must here mentioned one major market risk for a lot of institutional accounts who are under-invested in Apple Shares: and that risk is IF the SP500​​ start a correction with Apple Shares continue to grind. Now that we are post ER for Apple Shares, we are back at the main factor; Counter Trend. Breaking the 1976.5 level on SP500 futures on July 25 is bringing a brand new Counter Trend Phase for Apple Shares. ​the Mighty SP500 ( +2.85% ) in % since June 1 2014. ​​July 20 Countdown to ER ? ​​​July 20 Countdown to ER ( Earnings Release )? ​​​​​I did a special research update on Apple Shares prior Q3 ER schedule July 22.
at 100 in each case​​. 1) ​Peak Price ( Taking Closing Prices as a Proxy of the past 5 years - two trading Days prior of ER ) is reached 1 trading days prior to ER ​( in our case July 21 ) of an average gain of 0.36% on average for the past 5 years. 2) On ER Trading Day, we can expect a tiny pullback from the preceding day of 0.12% on average for the past 5 years. 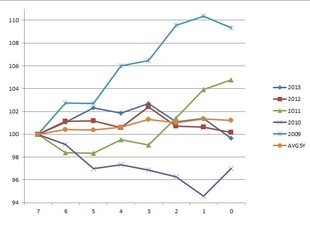 ( Blue line on the chart below ). 1) Since the Split in June 2014, Apple Shares Behavior are different: Retail Participants will bring more Volatility in Apple Shares Prices. July 13 A Choppy Road til ER ? 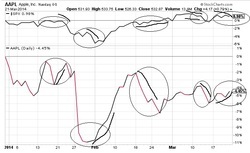 ​July 13 A Choppy Road til ER ( Earnings Release )? 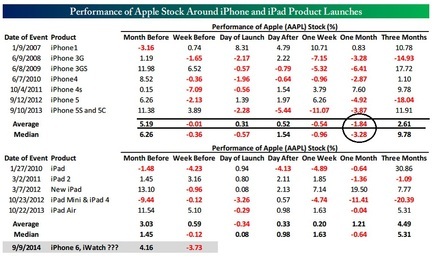 ​​​​​I did a special research on Apple Shares prior Q3 ER schedule for July 22. 3) From Peak ​Price til the closing price at ER, the surprise is that the level is almost the same ( 101.3 vs 101.23 - Orange line on the chart below ). It tells us that for the past 5 years on average, no price gain on average from 3 trading days til ER. June 29 Counter Trend and Month End ? ​​June 29 Counter Trend and Month End ? 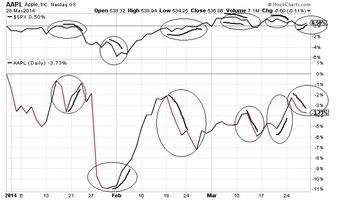 ​​​​​The counter-cycle between Apple shares and the SP500 is the usual trend. ​phase​ to kick in. I did mentioned it in the daily that I was expecting ​that. ( Day Moving Average ) on the ratio of Apple Shares and SP500 Index at .0472.
and traded as low ​as $89.65 on June 25. To reclaim the 20 DMA ratio, we need to have ( taking last Friday s close ) Apple Shares trade above $92.55. 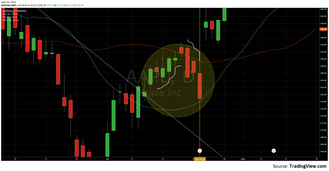 Already last Friday we had a daily close above the 20 DMA - the price ​​​​, not the ratio ( 20 DMA at $91.83 and we did have a close at $91.98 on Apple Shares ) that will bring momentum players. If on top of that, we are able to reclaim the 20 DMA ( on the ratio ), it will be technically speaking a very nice bullish combo. All that to say that I expect the outperformance of Apple Shares compare to the Mighty SP500 to continue in the next few sessions. The other factor that I follow near month end, is the relative performance of Apple Shares and the whole market ( SP500 Index ). When we observe major difference between both, it can bring some asset mix shift. That started since June 24. ​Alpha - Look for ​​​July - a month to rally? 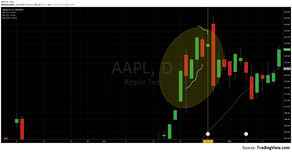 June 22 APPLE Technicals Behavior - The Retail Factor and Counter Trend ? June 22 The Retail Factor and Counter Trend ? ​Shares was already in the cards before resuming downtrend. ​Apple Shares and ​the Mighty SP500 in % since December 31 2013 ). The SP500 was already in a bullish wave, helping the Retail Crowd paying a top price for it. I think we still have a few sessions in that Counter Trend Wave that started ​since June 4 ​for Apple ​Shares. The SP500 futures is in overbought territory but continue to grind after the FOMC statement on June 18. To change that trend on SP500 futures, I need that we start to trade AND close below 1942 for now. ​IF so, then some Counter Trend trades ( selling SP500 to buy Apple Shares ) will begin. ​​​In terms of relative performance ( ratio of Apple Shares over SP500 - see 3rd chart below ), after a new peak on June 10, we started the corrective phase. 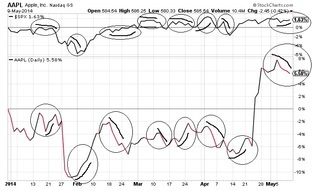 First the we broke the 20 DMA ( Day Moving Average - yellow line ) on June 18, a bad omen, and now quite near of the 50 DMA ( red line ) and previous peak price reached on December 5 2013 ( amber trendine ). I think that we will test and bounce on the last 2 levels.​​ I will keep you updated on the daily on that. ​​June 8 Update on The Upcoming Stock Split ? ​​On May 25, I did a first research on the Upcoming Stock Split. ​ETF s Volume Indicator : Overbought Zone ? ​The VIX/ Gold Correlation US Dollar and SP500: Higher Volatility Ahead ? the next few sessions, a huge mistake on a short term basis. And for those same reasons, I think Icahn waited a little to this week to sell a portion of his shares ( The last purchase of Icahn was based on that speculative and involment of retail players ). 2) The market take a pause or a tiny correction before June 2 to the ​$600.00 zone will bring a lesser pent up demand from retail participants. The following correction will be less violent ( consolidation around $600.00 zone ). ​​​Be ready and stay tuned - I ll keep you updated with the daily comments on that. ​​May 25 The Upcoming Stock Split ? ​​​The Upcoming 7-1 stock split for Apple Shares are a very rare case. participants to buy, a huge mistake. to retail investors ( and also options ). ​3) Lower the transactions costs as participants trade a full lot ( 100 shares ) instead of odd lot. 4) ​Gives the ability to Institutions and ETFs portfolio managers to rebalance more often. 5) As history suggest ( Master Card with their 10-1 stock split ), stock trades higher til the the record date and then fell from that date. 6) The last purchase of Icahn was based on that speculative and involment of retail players. I think that between June 2 and June 9, he will sell that portion​​ that he bought May 15 and put a lot of uncertainties for his remaining still huge position. ​​​May 11 Counter Trend and History ? The counter-cycle between Apple shares and the SP500 is the usual trend. From ER Date to the next peak closing, we had respectively for April 23 and July 23 2013, an increase in price of +12.0% and +13.4% in 9 trading days compare to the last one of April 23 2014 of +12.7% in 8 days. ​After we reached the peak, we had a price correction ( taking closing prices ) on April 23 2013 of 6.9% and it took 7 trading days. On July 23 2013, we had a price correction of 3.2% in 4 trading days. ​Now, already 4 trading days after the peak closing price of May 5 at $600.96, we had 2.6% price correction. ​​Even if we do not have many data, at leat we know that we are not far from reversal in time ( 4 to 7 trading days ) and in price​​ ( correction of 3.2% and 6.9% ) for a price reversal to bullish in Apple Shares. Be ready and stay tuned - I ll keep you updated with the daily comments on that. ​​​​​May 4 Counter Trend and SP500 ? ​That idea was first mentioned in the daily. But I will go into more details here. So on December 5 2013, Apple Shares closed at short term high of $567.90 (and a peak price at $575.14). ​Back then the SP500 Index closed at 1785.03 (and a peak price at 1792.82). For the market participants, the $600 level, IF broken, will provide another push into the next bull phase. I do agree in principle but with different approach for Apple Shares. We must use the ratio to conclude. For me, only when we will get over and break the 0.318150 ratio level with closing prices, then Apple Shares will be into a last bullish impulse to $629.70 first and $656.00 after. Because Apple Shares behavior are counter trend are the usual, for me only breaking that ratio of December closing level will give us the next bullish impulse. Til then, we may have a consolidation more in time than in price...​​ I will keep you posted on the daily on that. ​Trend to ER Behavior. More emphasis will be on ER in the next few sessions. ​traded down most of the time. 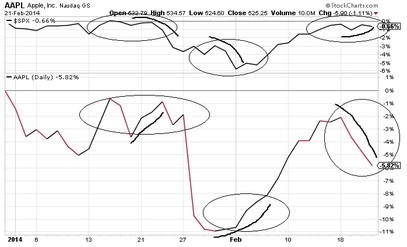 (See charts below of the previous 4 ER). So ER Behavior pattern will have that usual price action: we can expect Monday on a bullish note followed by a bearish Tuesday​.​ For after ER publish date, very tricky and inconclusive results for Apple Shares. ​​​​​March 30 Counter Trend Phase Not Yet Over ? ​the Mighty SP500 in % since December 31 2013. 1)​ Pre​ Earnings Release where Apple Shares did a lot better than SP500. 2)​ Post Earning Release were Apple Shares underperformed tremendously the whole market. ​3) The third phase was completed two weeks ago​ with the SP500 flirting with the new high made on December 31 2013 ( and making a new double top at 1844.5 - a shy of the previous high ever of 1846.5 ) and then the expected underperforming of Apple Shares (remember we had a shooting star pattern on February 18). ​were we saw finally a year-to-date positive returns for the Mighty SP500 ( up 1.61% ) and Apple Shares started to struggle ( down -4.88% ). 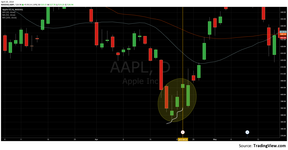 ​​Apple Shares are expected to play as couter trend and outperformed the SP500 IF the SP500 futures stay below 1868.​ With the closing on March 21, we are now above the 20 DMA ( now at $529.17 ) and the 50 DMA ( now at $530.65 ), all quite positive technical data. We MUST stay above those levels though. ​Then the cycle of counter trend of Apple Shares continue to prevail... ( See the whole counter-trend cycle explanation below ). And especially last week were it was almost a text book example. ​​Now, the tricky part this week for the performance of the SP500 is that geo-political risks are still well into play and can expect volatility to pick up. 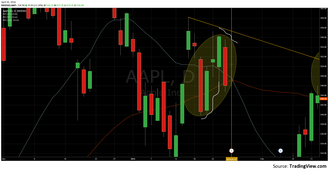 Apple Shares are expected to play as couter trend and outperformed the SP500 IF we see a down market.​ But even if I expect an outperformance, it can be with a negative price behavior for Apple Shares UNLESS we have a daily close above $535.00. Then the cycle of counter trend of Apple Shares continue to prevail... ( See the whole counter-trend cycle explanation below ). Feb 23 Counter Trend Phase ? ​​​The counter-cycle between Apple shares and the SP500 is the usual trend. 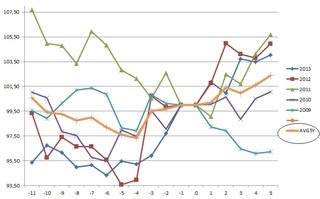 Observe on the chart below the cumulative performance of Apple Shares and the Mighty SP500 in % since December 31 2013. ​3) The third phase was almost completed last week​ with the SP500 flirting with the new high made on December 31 2013 ( and making a new double top at 1844.5 - a shy of the previous high ever of 1846.5 ) and then the expected underperforming of Apple Shares (remember we had a shooting star pattern on February 18). ​​Now, the SP500 will consolidate and start to pullback this week and Apple Shares will be in the process of bottoming out and rebound in the next few sessions...​ Then the cycle of counter trend of Apple Shares continue to prevail... ( See the whole counter-trend cycle explanation below ). 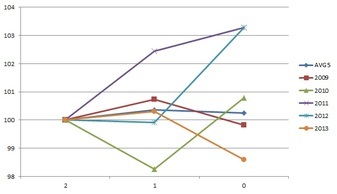 Observe on the chart below the cumulative performance of Apple Shares and the Mighty SP500 since Dec 31. There is two main phase - pre​ ER where Apple Shares did a lot better than SP500 and the same post ER. 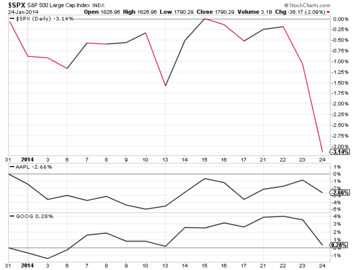 ​volatility; a situation that Institutional Investors like very much indeed.. See charts below. ​​​Jan 29: Now after ER and the capitulation in Apple Shares we hadon Jan 28, we can be back into the counter trend behavior vs SP500. What it is interesting is that during the capitulation process of Apple,SP500 was in the dead cat bounce phase, now completed. See charts below. ​On Friday the 24, a quite rare event happened​: SP500 was down more than 2% on a single day. What it brang with it, was the best performers since ​the beginning of the year like Google and Apple as shown​ by the chart below. ​​We had a disconnect ​at the beginning of last week because of the CHL double deal announcement and the unwind of it at the end of the week​.Also, the option drag on Jan 17 brang Apple Shares into oversold condition.